The Nord Stage 3 is the fifth iteration of the Stage series pianos, a continuance of Nord’s vision of producing the ultimate instrument for the performing musician. The Stage 3 features Nord’s latest technologies including the Nord Lead A1 Synth Engine with sample playback, the Nord C2D organ, an enhanced Piano Section and extensive hands-on Effects. The Nord Stage 3 comes in three models, which differ only in terms of their keybed and playing action. 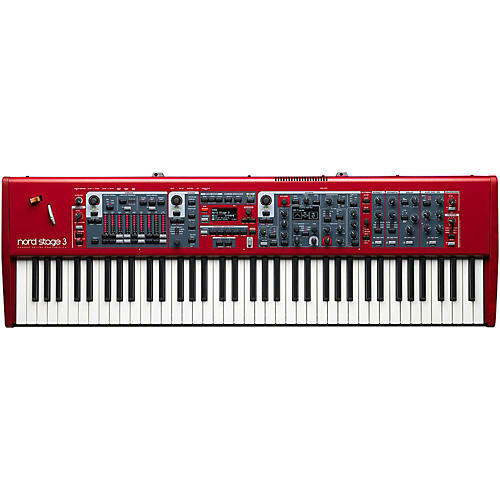 This is the Nord Stage 3 Compact with a 76-note portable weighted hammer action keys, range E-G.